Powerful, practical and precise, the Huawei Mate 9 offers revolutionary battery life of two days via a large 4000mAh battery as well as smart power-saving technology. Yet Huawei’s SuperCharge technology safely charges the device for a full day’s use in just 20 minutes. Huawei SuperCharge is among the world’s fastest rapid charging systems, charging at up to 50% faster than the Mate 8. Each of the 5-layer controls for voltage, current, and temperature provides an ultra-safe charge that keeps the Huawei Mate 9 fast. The phone features a Leica second-generation Dual Camera which offers unprecedented detail for images that take you from mere photography to photographic artistry. Equipped with a 12MP RGB sensor and 20MP monochrome sensor, the RGB sensor captures vivid colors, while the monochrome sensor picks out the finer details. The Huawei Mate 9 Pro also comes with a wider range of shooting capabilities, enabling you to take professional-quality shots in a number of different scenarios. Hybrid Zoom enables close-up shots in from greater focal lengths. 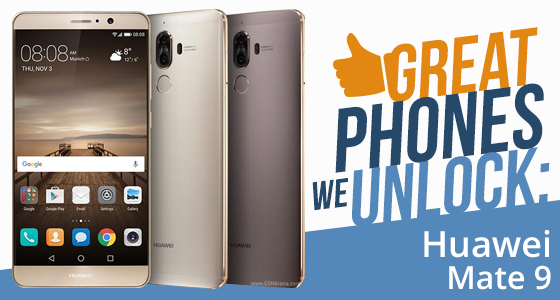 The Huawei Mate 9 has an 8MP Selfie camera with automatic face detection with custom beauty settings making it practically impossible to take a poor selfie. In addition, the Huawei Mate 9 features 4k video recording with optical image stabilization. It also uses the H.265 video compression standard, allowing for video file size compression of up to 50%. Running on Android 7.0 fresh out of the box, and powered by a Huawei Kirin 960, Octa-core CPU, the Huawei Mate 9 has a 5.5 inch curved AMOLED display screen, and has 6GB of memory and 128GB of ROM. Headquartered in Shenzhen, Guangdong, Huawei was founded in 1987 with just $5000 start-up capital by 72-year-old Ren Zhengfei, a former engineer in the People’s Liberation Army. From scratch, he has built Huawei to a point where it is a key world telecoms player with a presence in 45 of the top 50 most important telecoms markets worldwide, and with annual profits exceeding US$5.5 billion. Globe Philippines offers the Huawei Mate 9 with the myLifestyle Plan for PHP1499 (approx. US$30) per month complete with free Netflix and HOOQ subscription for 6 months and free 1GB Spotify premium or Disney Channel apps for 3 months. The handset’s RRP is Php31,990. (US$642) The phone is offered either as Pre-Paid or on a monthly contract of 12, 18 or 24 months. SMART Philippines offers the Huawei Mate 9 for just 800PHP (US$16) per month with any Smart Postpaid Plan ranging from 399 to 2999php (US$8 to US$60). Can UnlockBase unlock the Huawei Mate 9 from Globe Philippines or Smart Philippines? Of course, we can! We offer the largest database of global service providers and smartphones on the web. The device requires a code to insert when it asks for “SIM Network Unlock PIN“. This can be done online fast and economically by ordering your unlock code now!